The North East team have been busy inventorying the North Wing of Pitmedden House at Pitmedden Garden, and have come across a clock with strong links to the region. This beautiful Georgian Scottish longcase clock is enclosed in a carved mahogany case, with a clock face consisting of a main chapter ring (the band that depicts the numerals) surrounded by finely decorated cast brass. It also includes a subsidiary seconds dial, calendar aperture and strike/silent roundel. 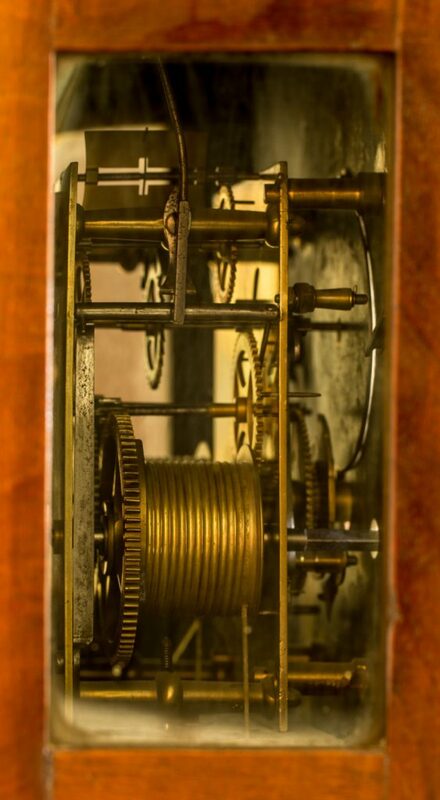 Two small windows at either side allow you to peer into the intricate clock mechanism. One of the earliest mentions of clocks, the ‘Common Knok’ (public clock), was recorded in the burgh records of Aberdeen in 1453. The ‘knoksmith’ trade became part of the Incorporation of Hammermen, one of the ancient trade incorporations in Scotland. Although a locksmith by trade, John Smith was the earliest practicing knoksmith admitted into the incorporation in Edinburgh, in the early 17th century. In 1647, his two sons were the first to be formally classified as knoksmiths in the Hammermen. 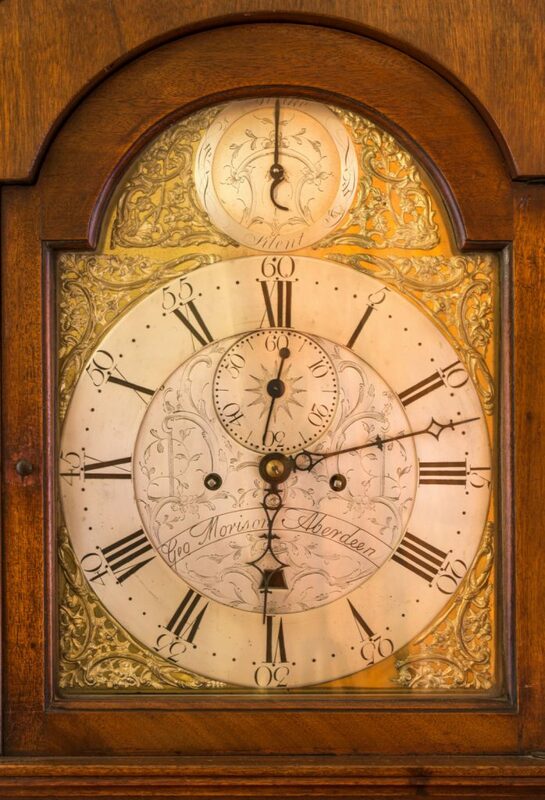 By the 1660s the longcase clock had developed as a particularly British style. Since clocks were highly fashionable at the time, demand was high in the domestic market and, to a lesser degree, in the European and North American export markets. The late Georgian period was a golden age in Scottish clockmaking, producing many excellent clockmakers. It saw the culmination of skills developed in Scotland from the late medieval period. 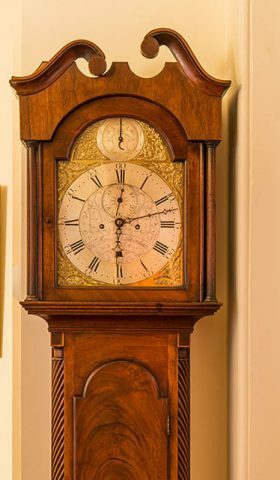 Close collaboration with European clockmakers, particularly from England and France, led to a higher standard of craftsmanship in Scotland than in many other countries. The man responsible for the beautiful piece at Pitmedden was George Morison, a clockmaker active in Aberdeen between 1772 and 1792. For a time, he partnered John Bonnar, another Aberdeen clockmaker. He also worked alongside his son John, whom he trained as an apprentice. His son later became a partner, continuing the family trade. A weekly column in the Aberdeen Daily Journal, ‘Notes on the Old Clockmakers’, written by R Murdoch Lawrence in 1921, listed the clockmakers based in north-east Scotland during the Georgian period – this indicates the popularity of locally made Georgian longcase clocks in the early 20th century. The column contained anecdotes regarding the trade’s history and included correspondence with interested readers. From the articles we discover that George Morison was one of many clockmakers active in the area, along with George Hardy of Fraserburgh and James Duncan of Oldmeldrum, maker of the old steeple clock in Stonehaven in the 1790s, to name just a couple. We are unsure of exactly how the George Morison longcase clock came into possession of the house; however we can but speculate that Major Keith was an interested reader of the Aberdeen Daily Journal in 1921 and shared in the delights of these magnificent examples of Georgian Scottish craftsmanship. *The North Wing of Pitmedden House is not currently open to the public, and so the clock is not on public view at this time. Subject to a redisplay, it may become available to view at a later date. This article is by Ross MacLennan, Inventory Officer, Project Reveal Team North East . Project Reveal is a multi-site digitization project of unprecedented scale. With your support, we can help the Trust manage its collections more effectively. Most important, we can help the Trust discover, better understand, and share its treasures with the world. Originally published by the National Trust for Scotland on September 1, 2017.